In this episode we speak with clinician and leader in horse behavior Julie Goodnight about seeing things from your horse’s perspective. 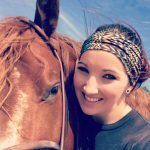 She talks to us about working with the horse in front of you that day, why you should never pick a fight with a horse, how horses respond to dynamic versus static pressure, considering your horse’s emotions, and much more. Learn more about Julie on her website or Facebook, watch her on Horse Master with Julie Goodnight on RFDTV, and listen on her podcast Julie Goodnight’s Horse Master Academy Podcast!